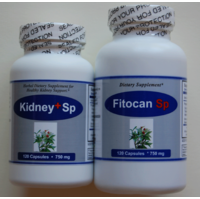 Each PC-Kidney-kit contains one bottle of Kidney+SP and one bottle of Fitocan-SP. This product combination is recommended as nutritional support for people suffering from polycystic kidney disease (PCKD) with high creatinine and/or high proteinuria (high protein spillage in urine). Suggested Usage: As a dietary supplement, take 3-4 capsules each time, three times a day, or as suggested by a healthcare provider. Suggested Usage: As a dietary supplement, take 4-5 capsules each time, two times a day, or as suggested by a healthcare provider. Sensitive individuals may want to take with food. Many thanks for your recommendation for using Kidney-tonic. I have taken two Kidney-tonic bottles, the creatinine goes down from 240 UM/U to 133 UM/U, Cholesterol from 7.5 to 5.0MM/l. These results are still little bit high, but I am very encouraged with them. For my kidneys, I have already taken 6 PC-Kidney kits. If I compare the result between last month and today it seems that the size of kidney cysts is reduced from 7.0 cm to 5.9 cm. These are the biggest of them. But the kidney size is still very big. It is more than 20 cm. There are still many cysts around my kidneys. This improvement is very important for my life. Currently, I am feeling pains in my back when I seat for a long time. I think that our local doctors have no way to treat it, but you can help me. I would very much appreciate your expert advice. I am waiting for your recommendation. Kidney+SP and Fitocan SP were designed by medical doctors and master herbalists from high quality concentrated unique herbal extracts, such as rare herbs Polyporus umbellalus, Ligusticum wallichi, Orthosiphon aristatus, Ludwigiua adscebdens which are traditionally known for their positive effect for healthy kidney and urinary function. These products are considered as natural dietary supplements. We use only the purest, superior quality ingredients in all of our products, including Kidney+SP and Fitocan SP. Our products are free from common allergens, food coloring, preservatives, binders, and fillers including gluten, corn and dairy and they are fully in compliance with industry standards and guidelines for purity of foods and dietary supplements. Note: PC Kidney-kit effectiveness may be enhanced by taking Kidney -Tonic for complete kidney support. Copyright � 2004 -2018 Fuma Natural - All Rights Reserved.